Nakawa Magistrate’s Court has today morning released the last three remaining suspects accused of murdering former police spokesperson Andrew Felix Kaweesi outside his house in Kulambiro, a Kampala suburb in March 2017. 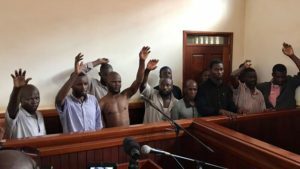 The release of the three suspects Sinani Hibwangi, Ali Mugoya and Ahmed Yusuf bring the total number out on bail to 19 people. Grade One Magistrate Noah Sajjabi released the three on a cash bail of Shs500,000 each while sureties were bonded Shs500 million not cash. Mr Sajjabi also told them to be reporting at police stations in their respective areas of residence every month before he adjourned the case to March 6, for further mention. The suspects are facing charges of murder, terrorism and robbing Kaweesi’s gun and a pistol after his assassination. It is alleged the accused on March 17, 2017 at Kulambiro in Kampala shot and killed Kaweesi, his bodyguard Kenneth Erau and driver Godfrey Wambewo and robbed them after the murder. Prosecution also alleges that the group and others still at large confessed to being part of a terrorist group Allied Democratic Forces (ADF) listed in the second schedule to the Anti-Terrorism Act 2002 between 2006 and 2007 while operating in various places within Uganda and DR Congo.